Over time, countless hunters have visited the Dream. The graves here stand in their memory. Hunter's Dream is also home to the Chalice Ritual, which allows you to delve into the Chalice Dungeons. The Plain Doll lives in the Dream and states her purpose is "to look after you". Gehrman, the First Hunter also resides in the Hunter's Dream, serving only to advice new Hunters. The last inhabitants of the dream, the Messengers, are "little ones" that find hunters, worship, and serve them. Eventually, dawn will break, and the night, and the Dream, will end. Gehrman presents the final test for the hunter and awaits you at the foot of the great tree in the adjacent field of flowers. 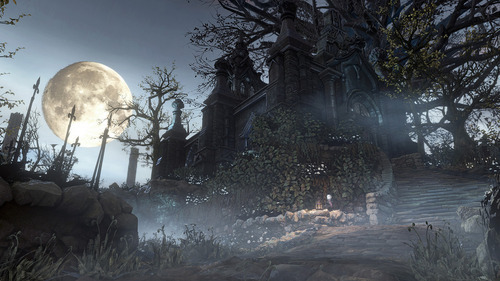 After the workshop is set on fire, the music that usually plays in the Hunter's Dream will not play anymore, though the same notes can be heard in the boss music against the Moon Presence. After the Moon Presence reveals itself the Blood Moon is always visible in the Hunter's Dream, and the sky is filled with thick dark clouds exactly like those in the Nightmare of Mensis. Hello, good hunter. I am a doll, here in this dream to look after you. Ahh, the little ones, inhabitants of the dream… They find hunters like yourself, worship, and serve them. Speak words they do not, but still, aren't they sweet? who revere the brave hunters. and any large movement will break the spell. To preserve the guise, proceed very slowly. brave hunters. Use them to send messages to other worlds. hunters across planes of existence. Dangling, upside-down rune etched in one's mind. Blood Echoes, but awakens afresh, as if it were all just a bad dream. originating in the child of the Vilebloods. them, as blood defines an organism.